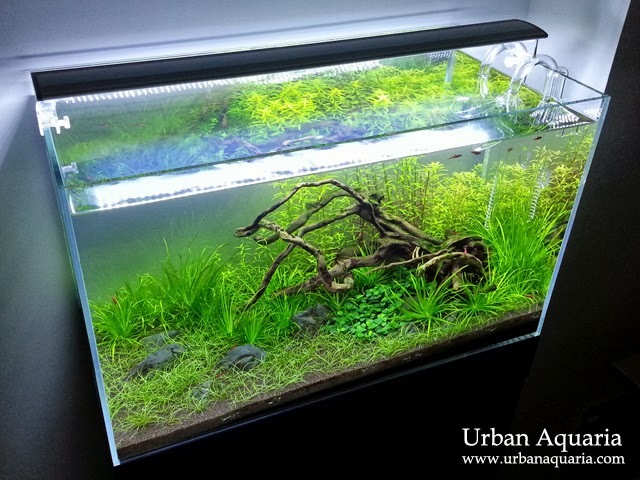 In my recent aquascape project, i was looking for ways to fill a section of the tank substrate area that is under perpetual shade, this meant that i had to use plants which could tolerate lower light conditions. In addition, i wanted something that could be shifted around easily without messing up the substrate and clouding the water. 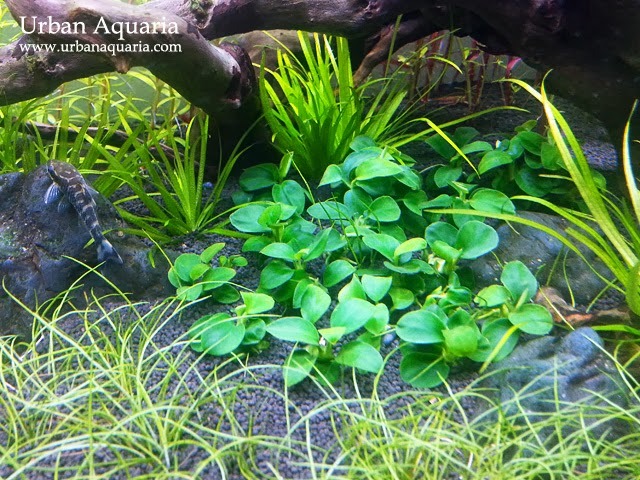 I had good experience with Anubias sp. 'Petite' in my other planted tanks as they exhibited nice compact growth in a wide range of tank and light conditions, but so far i have only attached them to wood pieces as accents or to fill small gaps between rocks. The idea to use them as an actual carpet plant popped up as it was time to harvest a bunch of new plantlets from my existing plants, so i worked out a plan to weigh them down with small pebbles, yet still keeping their rhizomes above the substrate. 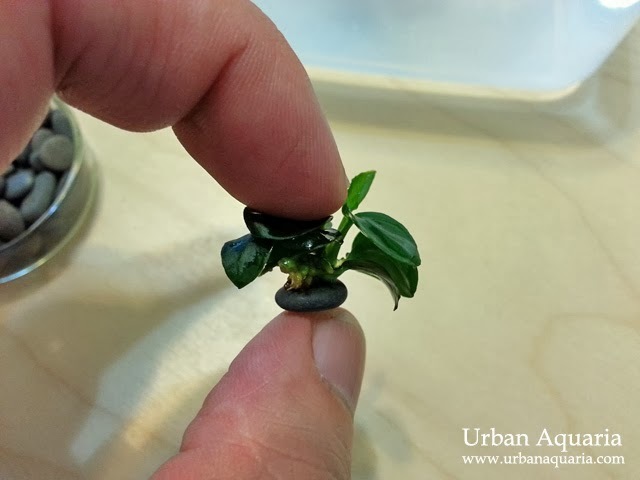 I split the harvested Anubias sp. 'Petite' plantlets into separate bunches, then prepared a tray of small dark-grey pebbles (around 5-10mm in diameter, from LFS), along with "jelly type" super glue (from Daiso). 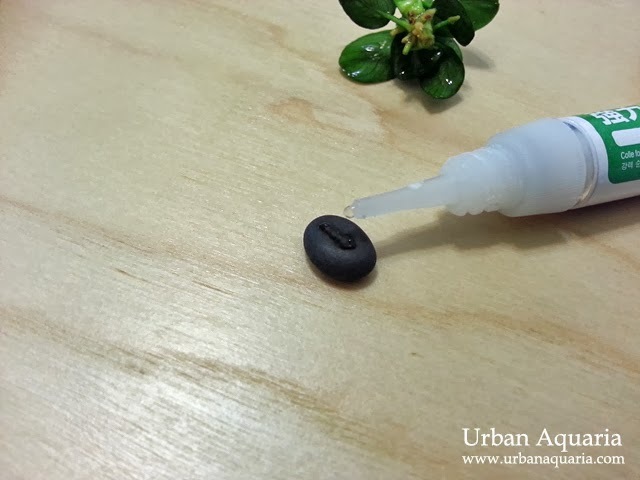 The "jelly type" super glue has a thicker viscosity than normal super glue (there is a percentage of resin content in it), so its much easier to use when gluing plantlets to objects. I have used this glue in my other tanks before and it has been safe for the flora and fauna so far. Though if you happen to keep particularly sensitive fishes or shrimps, it might be a good idea to just try a small amount in a spare tank to test first (and have peace of mind) before using it in your main tanks. 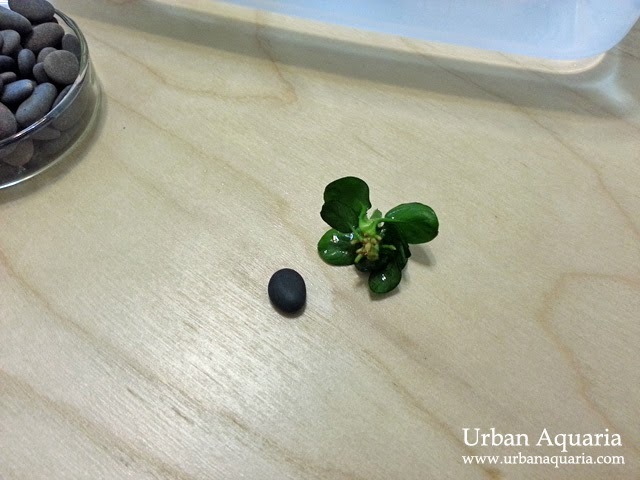 Select the pebble size to match the plantlet size. Trim away longer roots from the plantlet to facilitate easier attachment. Apply a few tiny drops of super glue, use as little as possible or else the excess could smear out and create an unsightly layer of visible residue. Find the widest surface area on the plantlet rhizome and attach it to the pebble. Hold them together securely for at least 15-20 seconds. 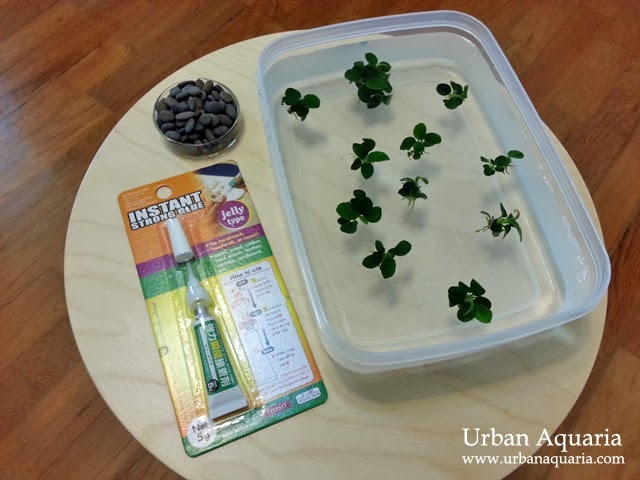 Just place them anywhere on your substrate and they will sit on it without floating, use a pair of tweezers to push them slightly into the substrate to hide the pebble bases, but still keeping their rhizomes on top. 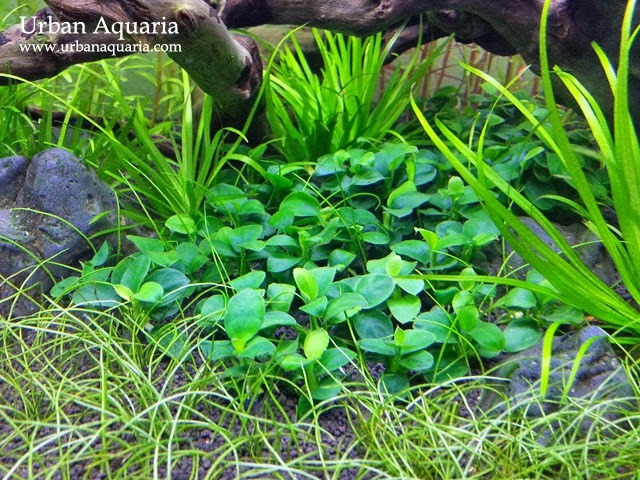 As you an see from the photo below, when grouped together the Anubias sp. 'Petite' plants make for a nice carpet of plants. Note that these plant will naturally grow roots into the substrate over time, so they'll be able to get additional nutrients though the soil and it also helps establish them more securely on the substrate too. As the plants grow, just harvest more plantlets and glue them on pebbles, then arrange them to gradually create a nice carpet effect. 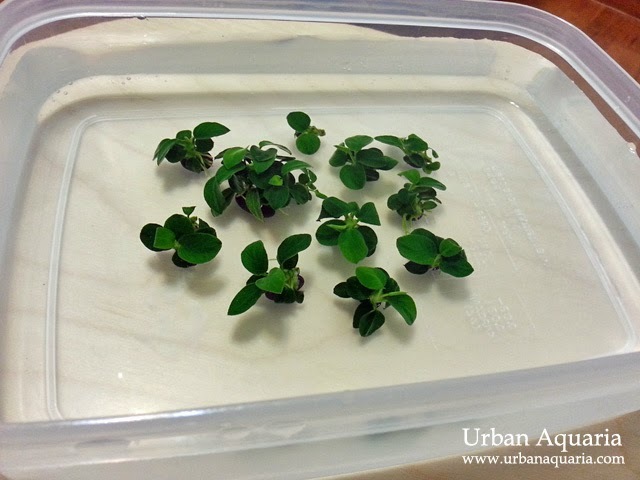 Here is what they look like in my current aquascape. Hello, great site and helpful info. I want to get some of the same glue, to try gluing epiphytes to a bark wall..tried a few HDB shops but only stock normal super glue, where did you get it? Hey there UA. Could I inquire as to where you got the pebbles? I'm gunning for the same planting methodology as yours in a new tank setup. I got the pebbles in a 5kg pack from Mainland Tropical Fish Farm... but they seem to also be available at other LFS too. I guess you'll just have to shop around to find them. Oh yeahhh . . . Now that you mentioned it, I do recall seeing it. I've been hitting NTUC/Giant's plant corner but to no avail. Thank you for the reply.